The domestic violence case against Jeff Woodburn, the former Democratic leader of the state Senate, is moving to Superior Court. The latest order indicates the investigation into Woodburn may have started after a tip from a fellow lawmaker. The lawyer for Jeff Woodburn's alleged victim says Woodburn's defense has pushed the idea that her client went to the police out of revenge over the failure of their relationship. Attorney Patricia LaFrance says she'd argued that's not the case in court and in pleadings. "My client was actually contacted by the Attorney General's office to see if she would come in. My understanding is that they had already become aware of it, from persons in the legislature." LaFrance couldn't say who that person or persons may have been. The order by Judge Thomas Rappa says LaFrance should, for now, refrain from filing more pleadings in the case, and says that her role is to represent her client’s interest in her dealings with prosecutors. Rappa's ruling says he will review records of counseling sessions involving Woodburn and the victim in private before he decides what will be allowed in at trial. Newly released court documents use Whitefield State Senator Jeff Woodburn's personal diaries to corroborate the domestic violence charges faced by the former Senate Democratic Leader. According to an affidavit filed by a state investigator, last Christmas Day Woodburn wrote in his diary that he was "focused on my failure to control my anger," "It is becoming regular and it scares me." In an earlier entry, from that August, Woodburn describes kicking the door off the dryer after an argument that included his partner throwing his clothes out on the lawn. A lawyer for New Hampshire State Senator Jeff Woodburn has entered a not guilty plea on his behalf to assault and domestic violence charges. Court documents filed Thursday indicate state Sen. Jeff Woodburn will argue self-defense in his trial on misdemeanor charges of domestic violence. According to WMUR, court filings made by Woodburn's attorney claim that any force Woodburn used against the alleged victim was necessary to allow him to leave a volatile situation created by the alleged victim. The filings also claim the alleged victim, his former partner, repeatedly tried to keep Woodburn from leaving her, including at one point brandishing a knife. 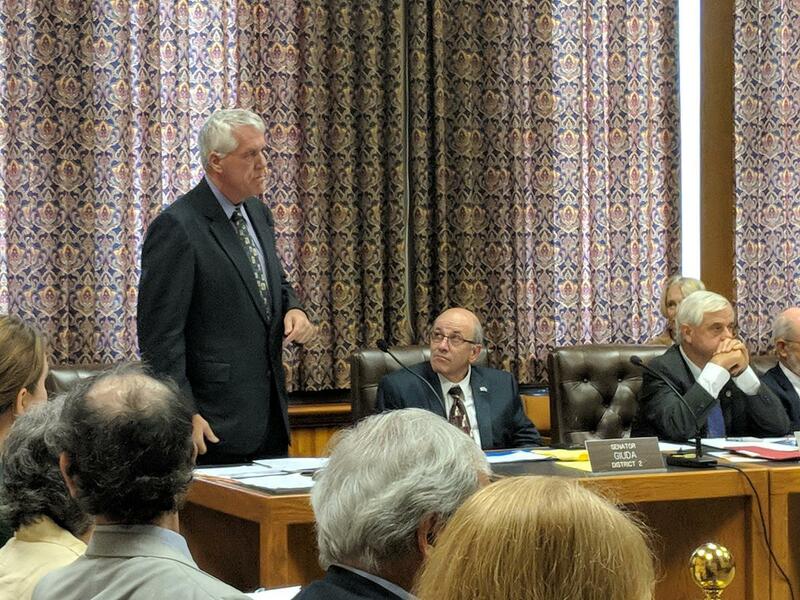 Fresh off a easy victory against a write-in opponent recruited by the Democratic Party, Jeff Woodburn returned to the state house for veto override day Thursday. All but one of his fellow Democrats in the Senate urged him to resign last month when he was charged with domestic violence. Woodburn says he intends to continue serving in Concord. "The only people I'm expecting support from are people in my district. They are the ones who have given me this job and they are the only ones who are going to take it away."